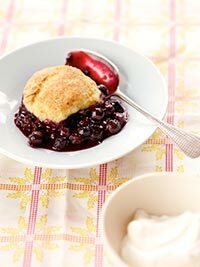 Frozen fresh wild blueberries add the perfect amount of zing to this delicious buttermilk biscuit recipe – not to mention twice the antioxidants of regular blueberries! Make the biscuits in advance and add the sauce just before serving for an easy to make dessert that’s full of extra delicious blueberry flavor! Whisk the cinnamon, sugar, and cornstarch together in a bowl. Add the berries; toss gently to coat. Transfer the mixture to a 9-inch square baking dish. Add the flour, baking powder, baking soda, and salt to a food processor and pulse until combined. Add the butter and process until mixture resembles coarse meal. Transfer the mixture to a large bowl and add the buttermilk slowly, mixing with a wooden spoon until the dough just comes together. The batter will be sticky. Transfer the dough to a lightly floured work surface. Working quickly and handling dough at a minimum to keep the butter cold, use floured fingers to pat the dough to a 1-inch thickness. Use a 2-inch round biscuit cutter or cookie cutter to cut 9 biscuits. Cut the biscuits as close together as possible to minimize scraps. If needed, gather the scraps together to cut additional biscuits until you have 9. Top the berries in the baking dish with the biscuit dough, spacing evenly. Place dish in the oven and bake until berries are bubbling and biscuits are golden brown, about 35 minutes. Transfer the dish to a wire rack and let cool for 10 minutes. Combine the yogurt and almond extract in a small bowl. Serve the biscuits and fruit with a dollop of flavored yogurt. Serves 9.